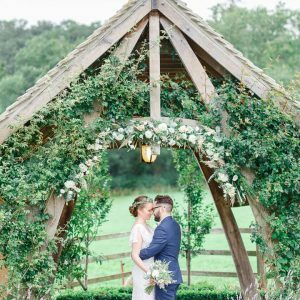 Today’s wedding is set in one of the prettiest venues I have seen in a long time. 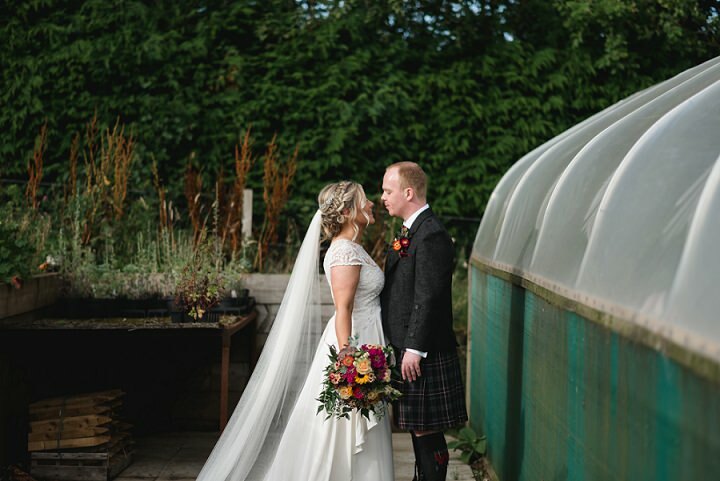 The Secret Herb Garden in Edinburgh is a really special venue, a gorgeous garden perfect for an outdoor ceremony, with a stunning glasshouse reception area and barn. 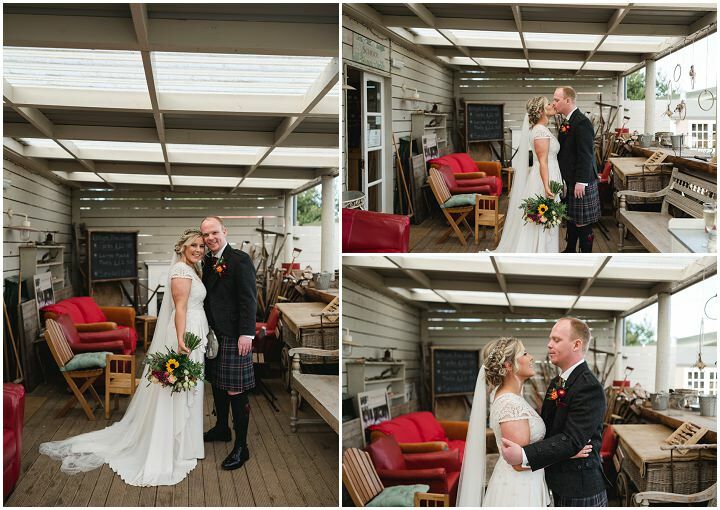 Ruth and David chose this venue as they were looking for a chilled out, rustic style venue with a relaxed and natural backdrop. 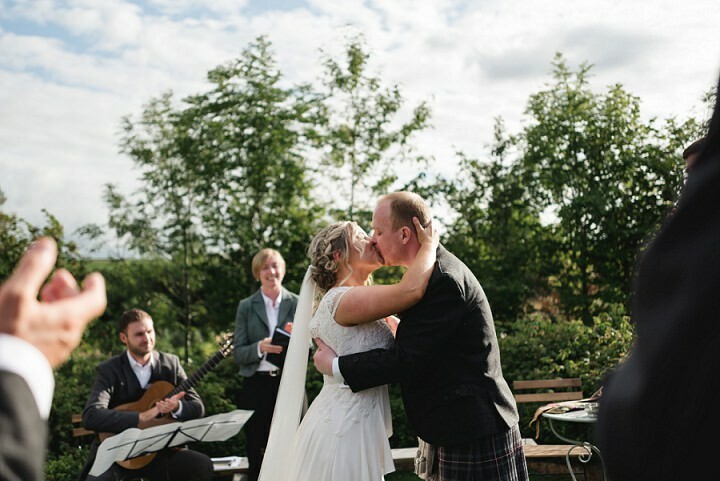 Ruth wore a beautiful Temperley London gown which I just adore and the whole day has been captured by Mack Photo. 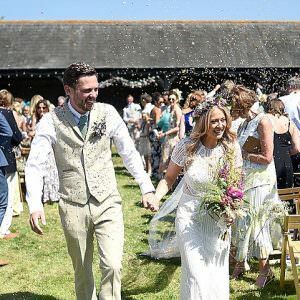 It was a relaxed wedding celebration that was very personal to us, and everyone we loved was there. These were the most important things to us. We were both studying at University of Glasgow, and we met on the dance floor of “Cheesy Pop” at the students union. The funny thing is neither of us of was supposed to go there that night but owing to their other plans falling through, we both ended up there with friends and we have been together for almost 11 years since. David proposed the night before we went flew out to New York in our house (He was worried about losing the ring en route). I was in our guest room where I had just finished packing, and David shouted to me that I had forgotten to pack something from our bedroom, so I went in, and David was down on one knee with the “something I had forgotten to pack”. We didn’t do a lot of allocation. We really made a lot of decisions about the wedding if it felt right, then we went with it. 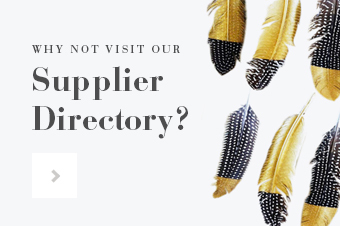 That isn’t to say we spent willy-nilly, not at all, but we knew what was important to us and to get right. 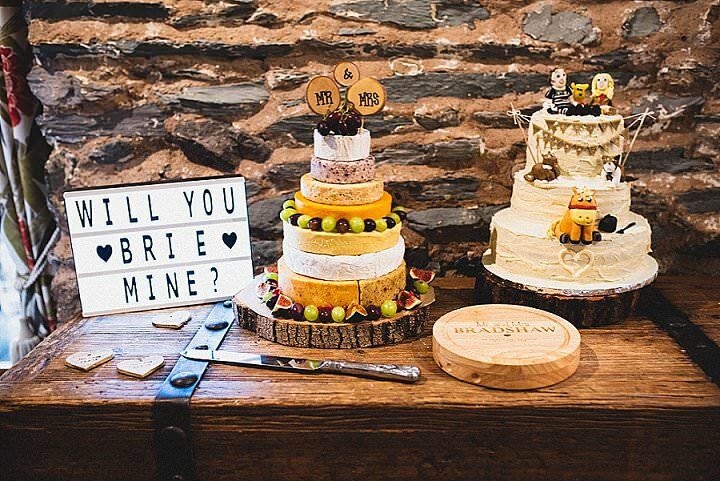 The venue was something we wanted to get right as we didn’t want something fussy that wasn’t representative of us and so a large portion of the overall budget went on the venue. Lindsey was recommended to us by a photographer who had done the photography for David’s sister’s wedding a couple of years prior. When we spoke to her and saw her work, we knew she would capture the day in the way we wanted- in a very natural, unobtrusive way. 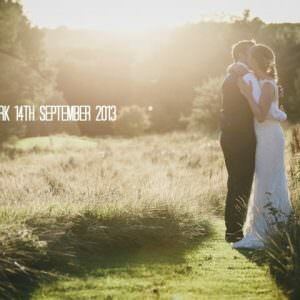 The photographs are beautiful and she captured the most special moments of the day. My wedding dress is by Temperley London from Rachel Scott Bridal Couture, and my shoes are Emmy London. Hair accessories were John Lewis. David’s Kilt, tweed jacket and waistcoat were all from Geoffrey (Tailor), Edinburgh. 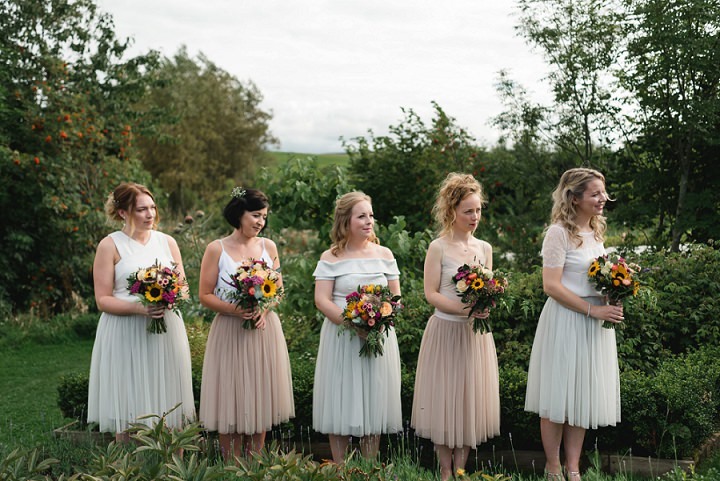 Bridesmaids wore Tulle skirts from Needle and Thread. I wanted each of the Bridesmaids to have a bit of their own personalities in what they were wearing, so I asked them to choose their own tops in white or ivory and their own shoes. To be honest, we didn’t really choose a specific theme or colour scheme. 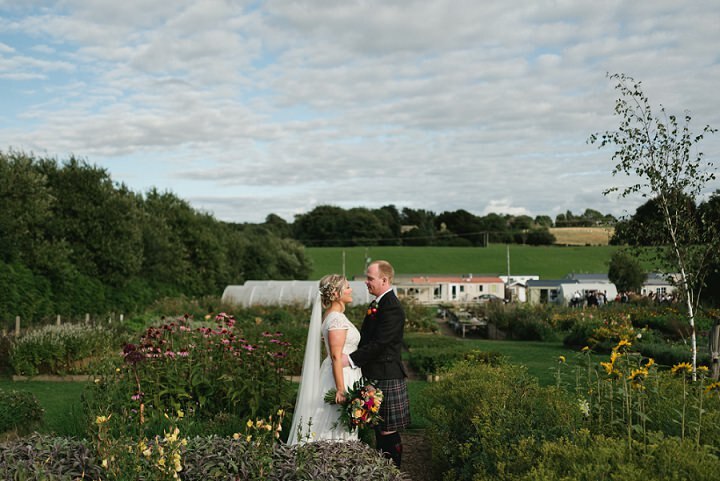 The Secret Herb Garden is so beautiful and green so we didn’t want to detract from that so kept everything very natural and in keeping with its unique, rustic and quirky charm. 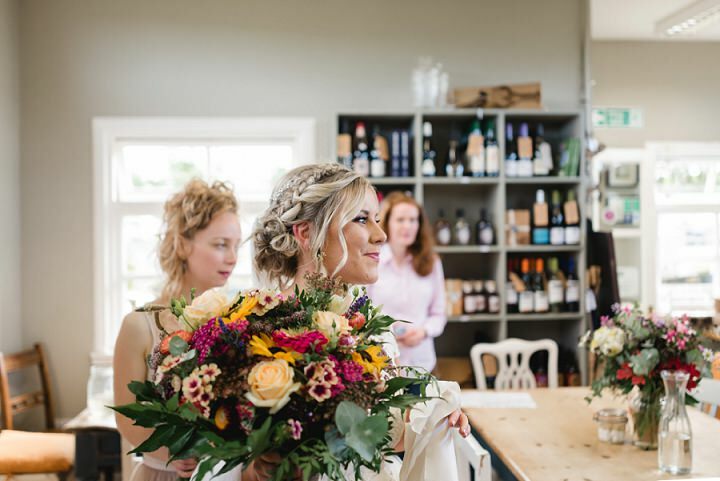 With the flowers, I wasn’t overly specific about what I wanted; all I knew was that with the natural colours of the venue and the Bridesmaids wearing Petal Pink, and Spearmint skirts, I wanted a bright, slightly wild bouquet –so colours like raspberries, peaches and something a little loose. I also love sunflowers so I was sure to ask that we could have sunflowers included. 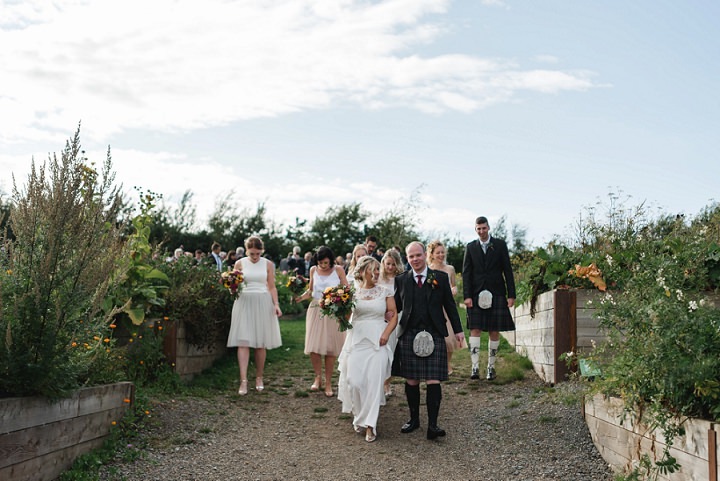 David and the Groomsmen had thistles for the buttonholes. 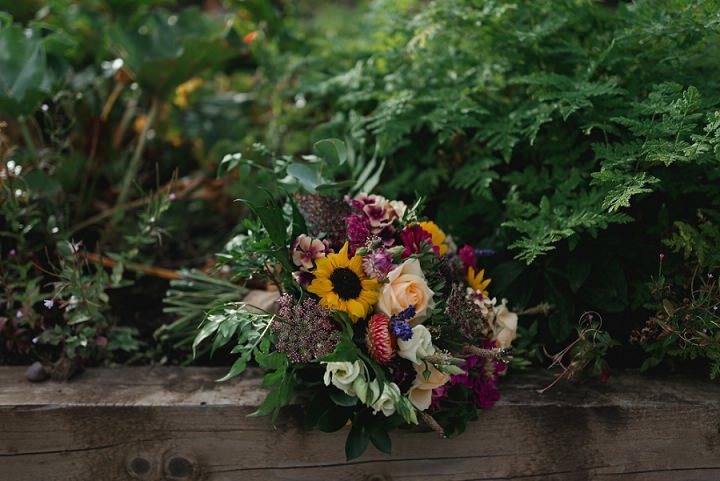 Our Mothers also had a posy bouquet each. 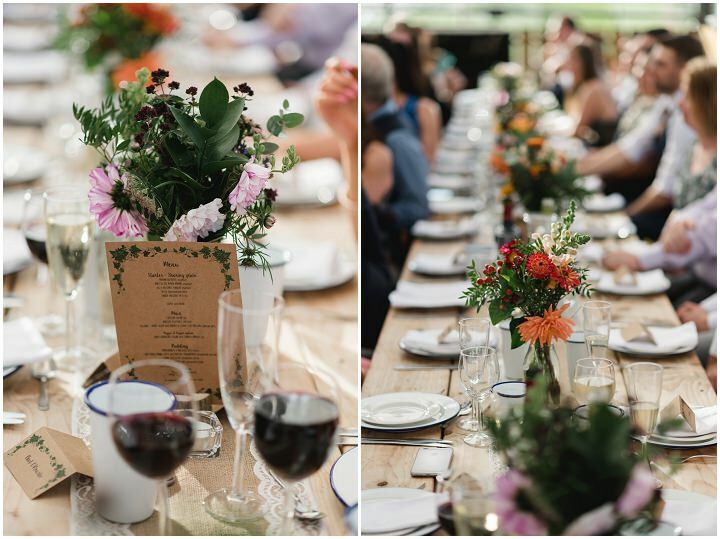 For the table flowers, The Secret Herb Garden provided wild flowers sourced on site. 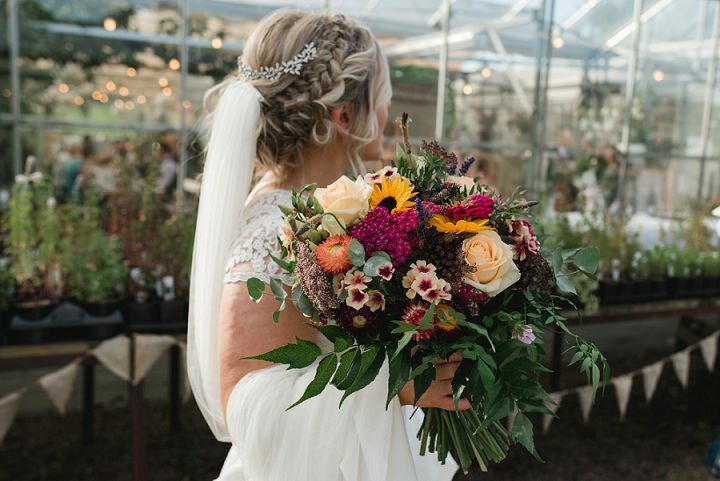 When choosing the decorations, we didn’t want to choose anything that detracted from the natural beauty of The Secret Herb Garden and we loved the rustic feel of the venue so in keeping with that, we kept everything very simple. 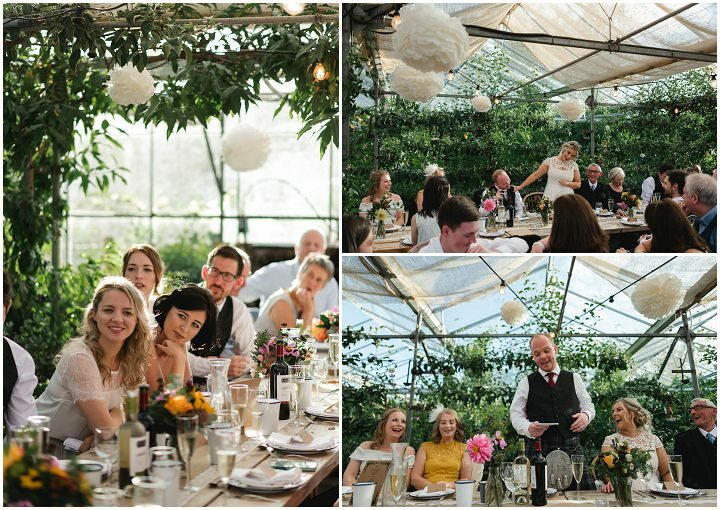 We chose to decorate the Glasshouse in ivory paper pom poms. 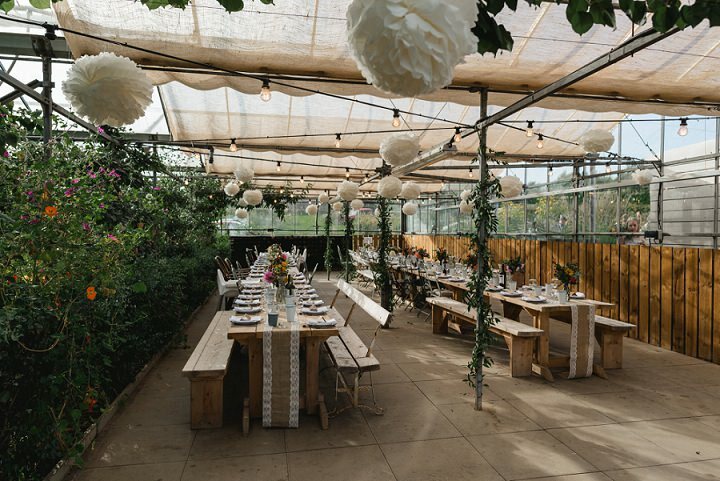 We also wanted to have a fairly relaxed feel to our day, so we chose to have banquet style seating and no top table. 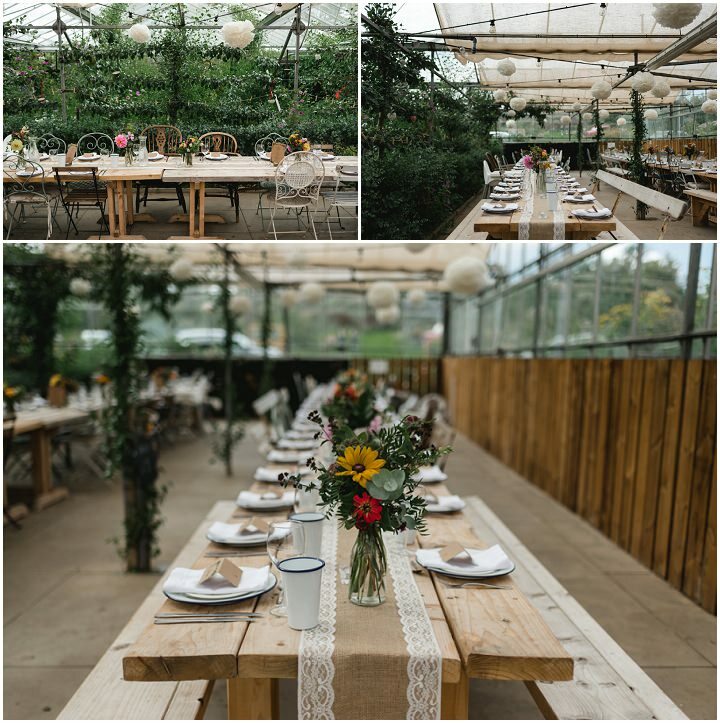 So, for the tables we had hessian and lace table runners, decorated with wild flowers, candles and little tree trunks for the menus. 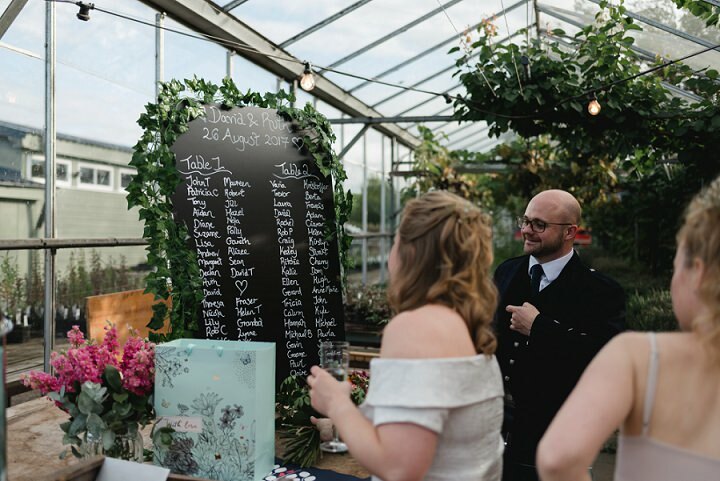 David’s Sister Nicola did our seating plan for us on a chalk blackboard, and we decorated it with more greenery! 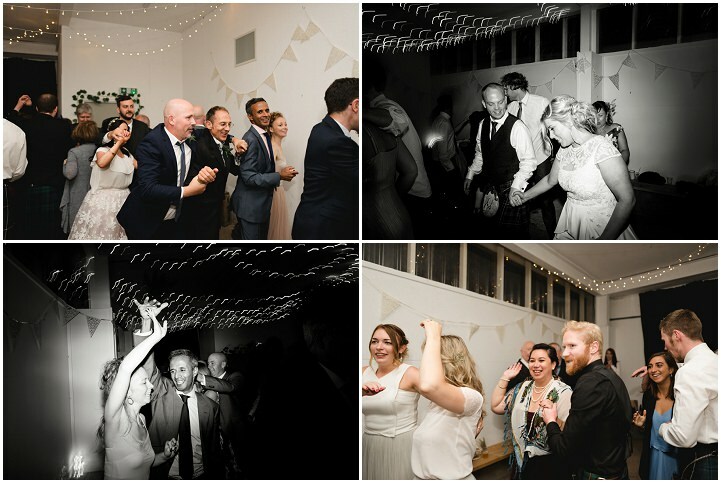 We decorated the barn with ivory lace bunting, some lanterns, and fairy lights running along the roof. We also added some crates, foliage, and kilner jars with fairy lights inside. I have to say our wonderful friends and family helped us to assemble the pom poms for days before, and put up all of the decorations the night before which was amazing! Again, we wanted to keep the meal really relaxed. Wendy our chef was super throughout, from our initial meeting right up to the day itself. For the starter we had a sharing platter which included Hummus, Marinated olives, Rapeseed oil, Balsamic vinegar, Wild garlic pesto, Smoked mackerel pate with bread. For our main, we had Chicken or Vegetarian Tagine, couscous with roasted veg, pine nuts and orange along with a Beetroot and carrot salad with orange dressing. For dessert, we had options of Apple toffee crumble, Lemon cheesecake, Pomegranate and prosecco jelly and Panna cotta with roasted strawberries. 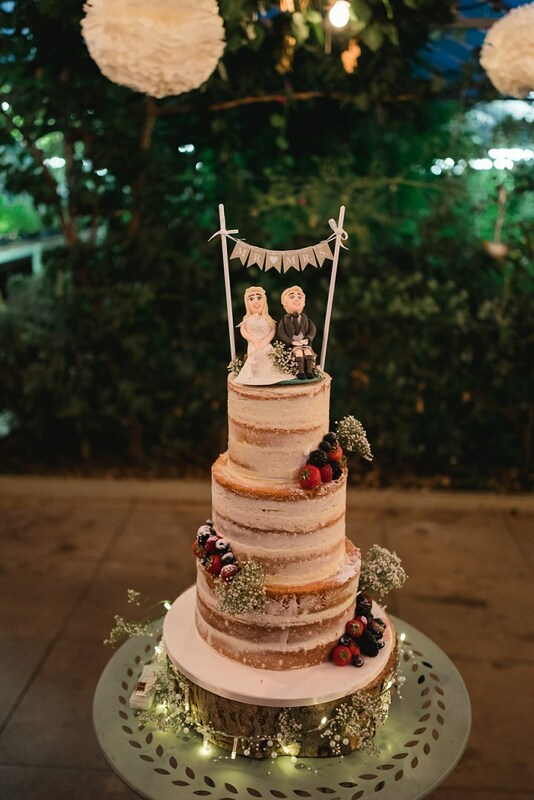 The Wedding cake was a three-tier semi naked sponge cake with buttercream and summer berries. There was one raspberry and coconut sponge layer and two Victoria sponge layers. 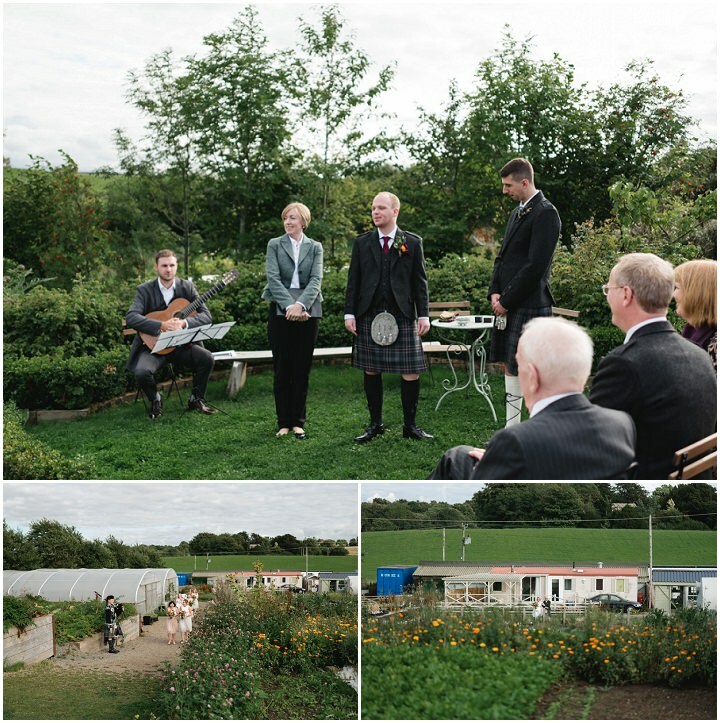 For guests arriving we had a piper and then for the ceremony, a classical guitarist, Stephen Joseph. 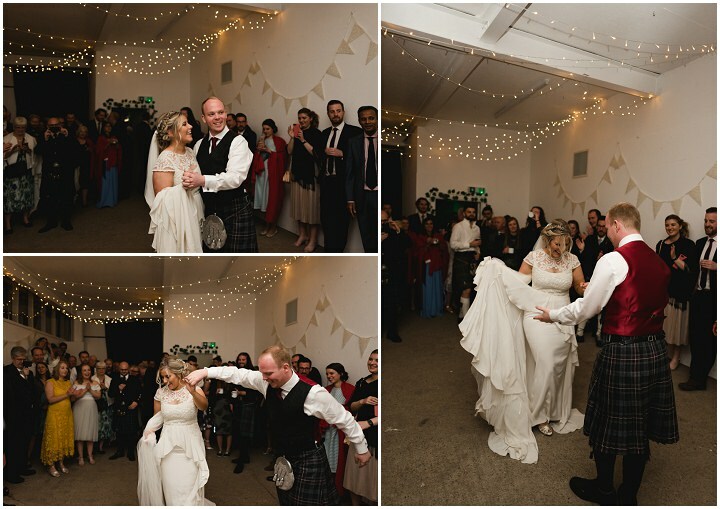 For dancing and merriment in the evening, we had a fantastic band, led by Rosie Bans who did a mixture of Ceilidh and covers for us. 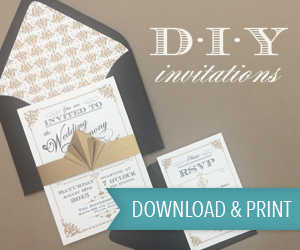 We organised our own save the dates, invites, and thank you cards online. 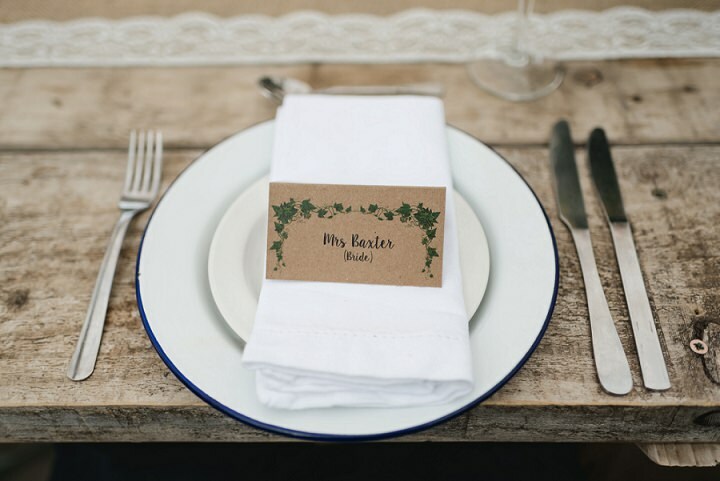 One of my dearest friends and Bridesmaids, Diane created the menus and place cards for us. 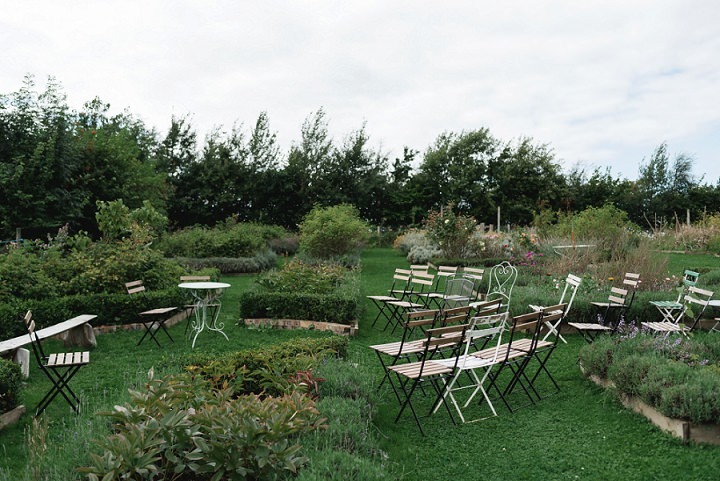 The Secret Herb Garden is a venue where it is totally up to personalise your day as much or as little as you want. 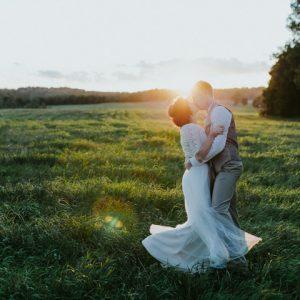 So in many ways, the whole day is personal because your wedding won’t look exactly the same as any other couple who chooses to get married there – that’s how wonderful the venue is. 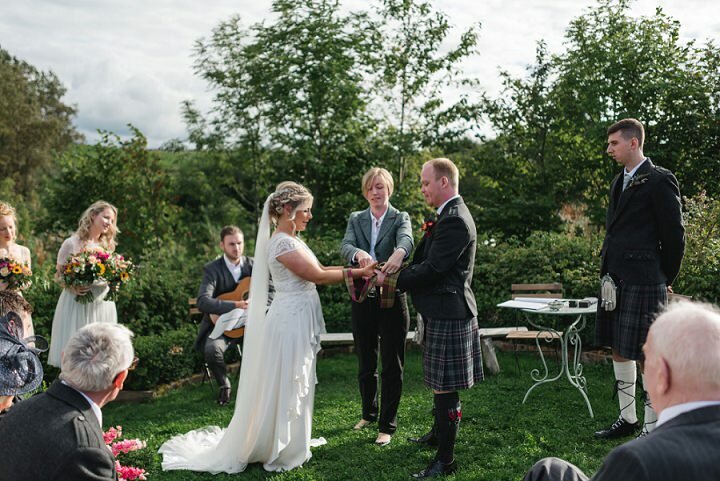 We did a traditional hand fasting for exchanging our vows which is of course where “Tying the knot” is said to originate from. 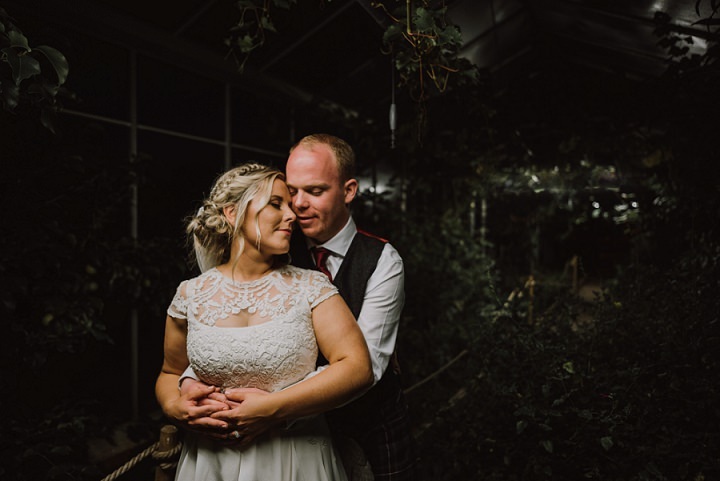 But rather than use white ribbons, we chose to get the ribbons tailor made and use a variation of the Baxter (our surname) tartan to symbolise the start of our marriage together. 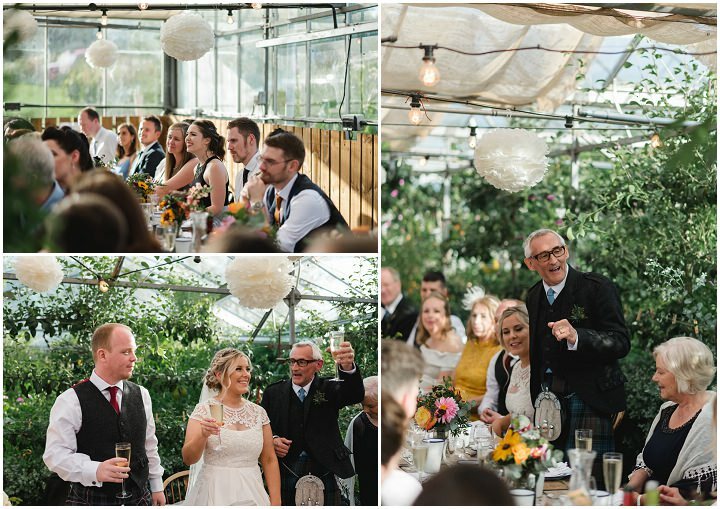 The ceremony and the speeches! 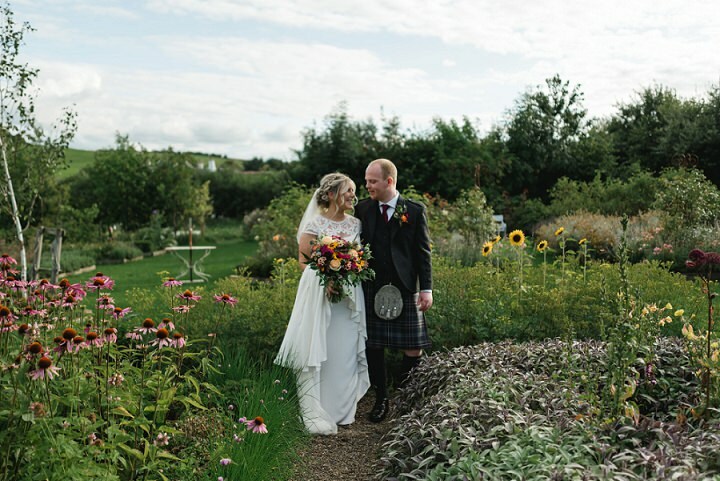 As soon as we were exchanging our vows, the sun was beaming down on us outside in the rose beds. 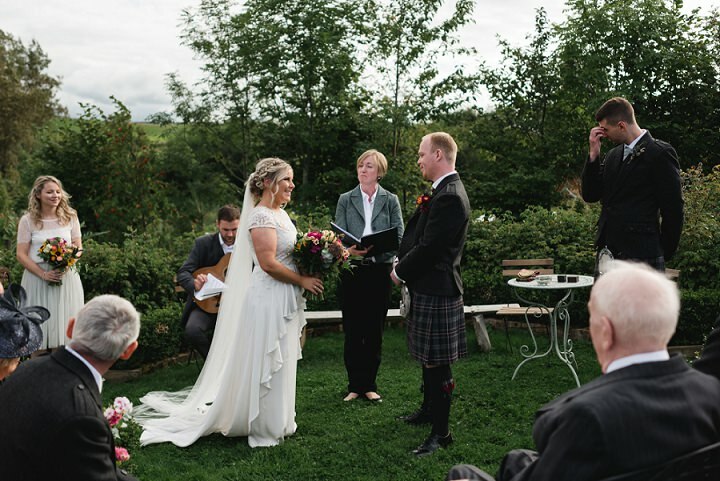 The ceremony was very personal to us in many ways. 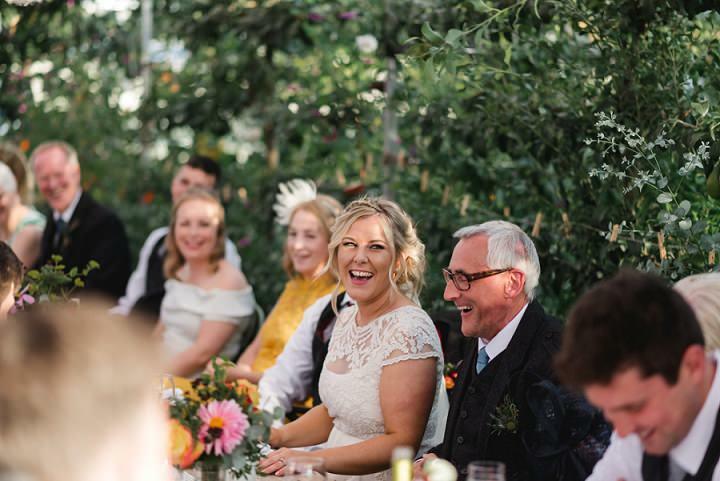 Prior to the ceremony our Humanist Celebrant, Fiona Thomas asked us to provide three things we loved about each other, but we weren’t allowed to share these with each before our big day. Hearing these on the day was so special, particularly as you were sharing this with your family and friends as well. 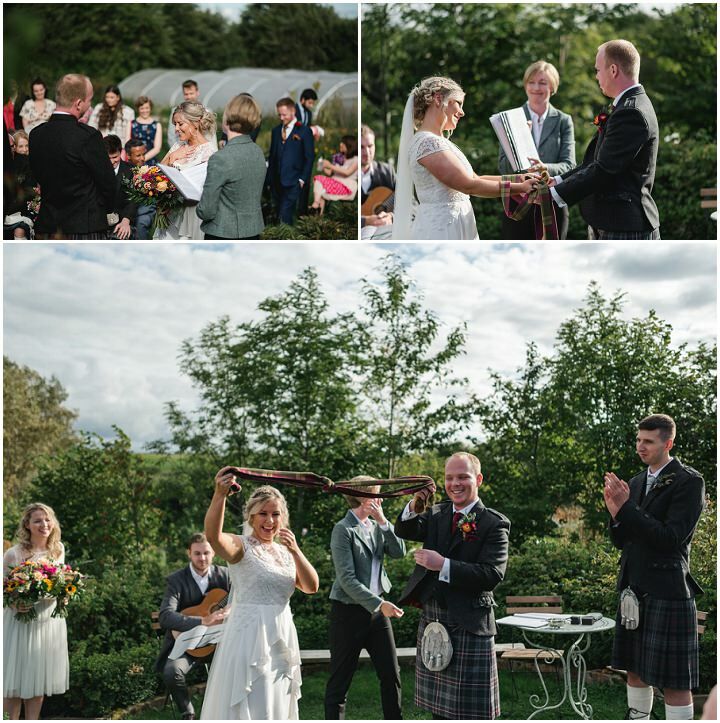 The ceremony also included the story of how we met and what marriage meant to us as individuals. The speeches our family and friends gave were fabulous and spoken from the heart. Don’t forget what that day is actually about, and don’t worry about the unimportant things. 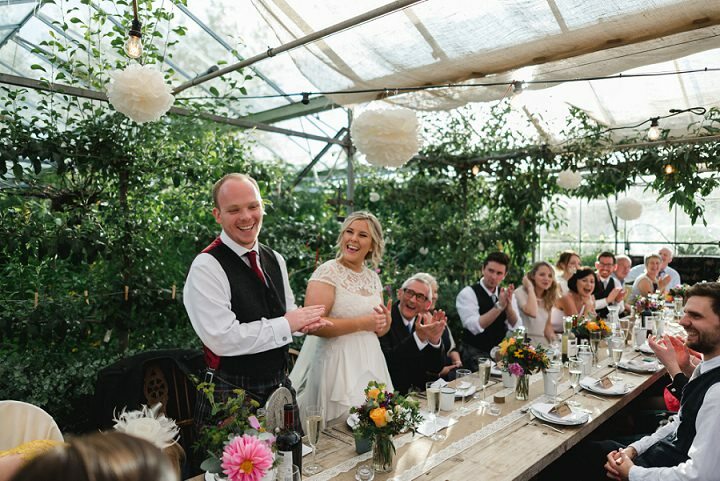 Take a few moments alone together, just the two of you to stand back and take it all in – the commitment you’ve made to one another, and recognising how special it is to have your family and friends in one place there celebrating with you. Hearing what each other’s “Three things” were. 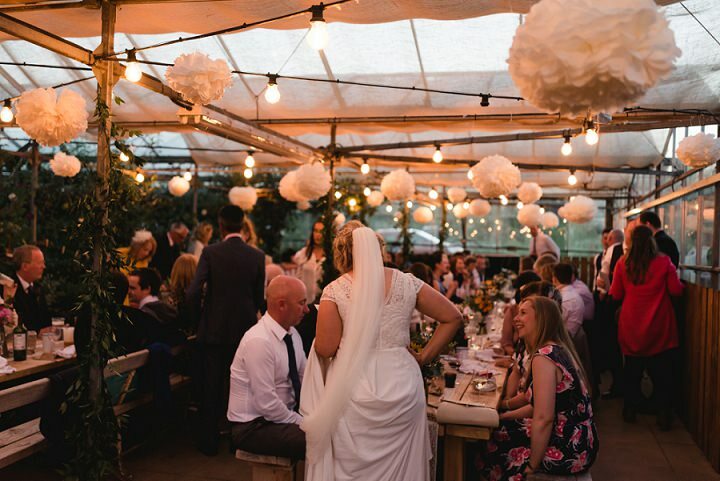 I love the feel of this wedding, it looks so intimate and cosy in the evening!